Firstly, thank you and a massive hello to my new followers - I've had some lovely comments recently and it's been a real pick me up as I've been a bit poorly. Also, given me a real boost about blogging as I was feeling a definite lull (is that a word?). So thank you, really. I'm going to try and organise some kind of giveaway soon as an additional thank you. Secondly those of you who have followed me for a while will know I'm kind of obsessed with Whistles. When I say kind of, I mean very. Their clothes just get better and better (and if their AW12 press day was anything to go by, this only looks set to continue). I have always bought my staple pieces from there, and over the last couple of years their trend bits have become amazing. 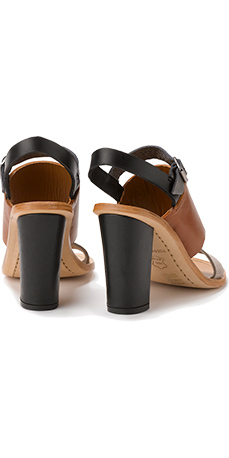 But, I've recently discovered their footwear - and it's good find and an amazing alternative to the insanely expensive designer styles that are very similar to Whistles' designs. 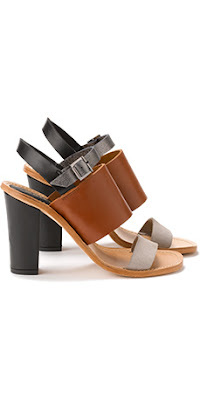 My two favourite pairs are above - I love the Noemi Sandal's (first pictures) clean lines and neutral tones. Who said never to mix brown with black? At £125, you know you're getting quality and the mix up in colours means you can wear them with nearly anything. There is something distinctly Acne and Burberry SS12 about them - but at a fraction of the price. Buy them here. Also a massive fan of the Odeile Sandal, a fab flat shoe with a pop of bright orange. Tangerine is hot for SS12 and this design is a great way of subtly adding a little 'current look' into your wardrobe. I'm a massive fan of flats for this year - fab for urban living (always game for ways to keep cool on the tube!). The design again mimics the tribal looks in designer collections like Burberry, Sass and Bide and Acne. Buy them here for £95 and check out all of Whistles new pieces here. Oooh I love the first pair! oh wow, that second pair look like they're from Marni. 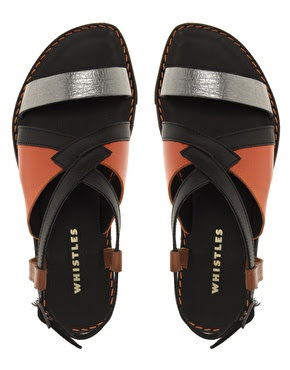 I didn't even know Whistles did shoes, so thanks for this post. The clothes I get the most comments on are always from Whistles (or H&M, funnily enough). keep going with the blog - it's like a little dive into a magazine off the shelves. And whistles is fantastic, completely know what you mean!